Wanna Know Where To Retire? Choose Tallahassee - Just Like Home! There are millions of baby boomers around the world trying to decide where to retire, and if long-term reader "Bill" has anything to with it, they are going to choose Tallahassee. Bill has given the Tallahassee Real Estate Blog great feedback over the years, and his recent comments center on the fact that Tallahassee needs population growth to help the housing market recovery, and courting retirees could be a very wise part of this solution. He adds that Tallahassee is "sorta just like home" for many who come here, so getting Tallahassee into the running for "where to retire" should not be hard to do. Last August, we shared an article from the Democrat, written by Elizabeth M. Mack, that announced the new Choose Tallahassee initiative. This marketing campaign was designed to lure more baby boomers to the Tallahassee area as where to retire. Here we are six months later and that campaign apparently died. There is a choose Tallahassee website that shows little, if any traffic. As a matter of fact, the article I wrote about the campaign is the #1 search result on Google for "choose Tallahassee." Our whole community must do a better job of spreading the word that Tallahassee is the "where to retire" capital of the world! This means that many of us understand the need to get the word out about Tallahassee, but there is no collective effort to make it happen. This part is simple, and we all play a part in the getting the word out about Tallahassee. Help spread the message, "Tallahassee is where to go when you retire." When you see positive articles on Tallahassee, share them! Put them on Facebook and any other social media applications that you use. The viral effect of all of us spreading the word about the benefits of living in Tallahassee could help restore our local economy, as well as the slumping housing market. You can be part of a great support system for Choose Tallahassee, so help spread the word! Look to the top left margin on the Tallahassee Real Estate Blog and the social sharing buttons are all there. Spread the word in your network, and ask them to do the same. 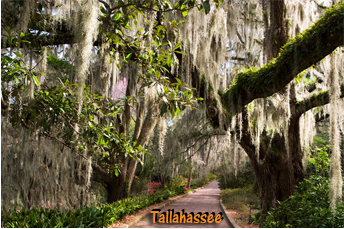 And the next time you are asked about where to retire, remember to tell them to check out Tallahassee, Florida.